A few days ago we hosted a live webinar titled “Nanoparticle Size Characterization: Tips & Tricks with the Zetasizer Nano.” This seems to have been a topic of interest for many of you, since – with apologies – I did not get to answer all the questions coming in at the end of the presentation. So here is my follow-on to the event. › What are the advantages, where are the limits? › Do you need an intensity or number distribution? › What refractive index to choose for the particles? After briefly addressing the definition of a nanoparticle and a detour on electron microscopy (TEM, SEM) as well as small angle X-ray scattering (SAXS) the focus went to nanoparticle tracking analysis (NTA) compared to dynamic light scattering (DLS). At the core, DLS provides excellent ensemble statistics for an average size (by intensity), average polydispersity index, and a moderately peak-resolved distribution by mathematical inversion. NTA on the other hand provides single particle tracking for a highly peak-resolved distribution by number combined with reasonable concentration determination. Which distribution is better? It depends, they can both be right. Continuing with DLS only, an advantage is that the intensity distribution is always correct (provided the data are of decent quality) regardless of the refractive index of the material. This only comes into play when volume or number distributions are derived from the intensity data – but even then for true nanoparticles this will matter very little. 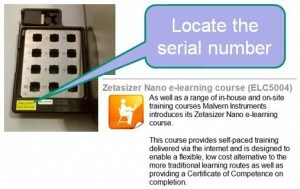 The tips went from how to obtain access to the Zetasizer e-learning course, to creating custom workspaces. Click here to playback the recording of the webinar if you missed it. Q: If I have a mixture of micelles and liposomes, with DLS, which measurement method will give a true reflection of size distribution? Intensity, volume or number? What’s the advantage and drawback of each? Thanks! A: Please also check this previous blog post. If you have small micelles and bigger liposomes, then the intensity distribution will show a larger contribution from the liposomes (by scattering intensity) whereas the number distribution will show a larger contribution from the micelles (by number). These results are both correct. Number distributions emphasize the species with the highest number of particles (which often tend to be the smaller ones). Intensity distributions emphasize the species with the largest scattering intensity contributing to the overall result (which often tend to be the larger particles). If you are trying to make very clean samples without any large aggregates, use the intensity distribution, which by the way is the preferred method for DLS in any case. If you are trying to see mostly the smallest nanoparticles in your preparation, try the number distribution (provided the DLS results are of good data quality). Q: Can you obtain useful information on exosomes by DLS if an instrument for NTA is not available? By peak intensity we have larger vesicles, but by peak volume most are <100 nm. It seems as though reporting of peak intensity is more common. A: If your sample is “clean enough” (i.e. does not contain large cell debris etc.) and there are enough exosomes (so that there is enough scattering intensity) then DLS can provide information. There exist some publications on this. Yes, by volume the peak mean will often be smaller (see blog post) – and number may even be smaller. NTA detects a number distribution. Peak intensity is most common for DLS because it is the closest distribution to what is measured (i.e. the intensity of the scattering particles). Q: When measuring with front or backscattering on the same sample, completely different sizing is observed. Can you explain this? A: For very small nanoparticles the scattering profile is isotropic, which means the same amount of light is scattered in all directions. For larger particles the scattering profile will change to even show maxima and minima at certain angles (as shown in the photo to the left). In general, larger particles scatter relatively much more light in forward angles. If data is now compared between forward and backward angles then it is possible that the forward angle data contains more signal from any larger particles present in the sample. In other words, by intensity the average size in forward scattering is larger than the average size in backward scattering. Provided the data quality is decent and the refractive index properties are known, the intensity results when converted to a volume distribution should be very close again. So yes, it is entirely expected that the results by intensity from different scattering angles will be different. Q: How can we measure the size of materials that we don’t know the refractive index and the absorption? A: If the particles are expected to be nanoparticles then it may not matter at all, see previous discussion on what refractive index to choose. For larger particles, the intensity distribution is still correct, it is only when the volume or number distribution is calculated then the refractive index knowledge is important. DLS measurements can be performed and interpreted without refractive index and absorption of the material. And this is a distinction to laser diffraction for which these parameters are typically required. As an aside, you can contact our help desk if you do not find material properties; they may have the values from previous measurements on similar samples. Q: How about measuring the size of thermoresponsive polymers? With a mixed sizes of polymers? A: Yes, this works very well with DLS. Thermoresponsive polymers like PNIPAM have been used for DLS. In particular, size measurements as a function of temperature can be done in an automated fashion overnight with the Zetasizer software. If different sizes are present these may or may not be resolved as separate peaks, if higher resolution is needed one may have to consider a separation technique like gel permeation chromatography in conjunction with light scattering. Q: Is DLS reliable for samples with 200 nm size? A: Yes, DLS is very reliable for 200nm particles. DLS can work really well up to a few microns (if there is no sedimentation and there are enough particles in the scattering volume). The vast application range for DLS is in the range from 1nm to 1 micron, that is the perfect peak performance range of dynamic light scattering. A range of Latex standards measured with DLS are listed in this technical note. Q: We were thinking about using Triton at about 0.5% as dispersant for TiO2 nanoparticles of ~ 70nm size. In your experience would Triton cause issues during DLS measurements? A: Triton can be used, and will probably not cause any issues. However, it is a good idea to measure Triton at the concentration you want to use by itself. It may form worm-like micelles and distort the results. Your TiO2 samples may on the other hand show so much scattering signal that this may overwhelm any signal from Triton. You may find this article on TiO2 useful. Q: My Zetasizer results often say that our particles are around 10 nm. We’d like to know more about the particles, but it doesn’t seem like any other Malvern devices can give information on particles that small. Any suggestions? A: That sounds like a nice problem to have; many researchers are concerned with trying to avoid big particles and devising ways to make them smaller. While we do not offer TEM, SEM, or AFM there is a technique that might provide some additional insights on your particles: the Viscosizer can directly measure a volume weighted size, and intrinsic viscosity may provide some information on the structure of your particles if they happen to be polymeric/nonspherical. Q: Can you comment on runtime (how long should it be?) and number of runs (reproducibility)? A: The software has an automatic mode. In this setting, it will acquire enough photons to give a statistically relevant result. If you want to manually set values, aim for accumulating at least 1 Million photons. To check how reproducible the values are the very minimum would be three, however most researchers will make more runs for increased confidence. It is possible to do many shorter runs, and this can be of use when a changing process has to be observed. Here, the inherent fluctuation in the short measurements is accepted in order to be able to tell an overall trend over time. This would be a good use of the manual mode, however in most other cases the automatic mode prevents any incorrect settings. A: This is sample dependent – and there can be data with quite large pdI that still are appropriate. There is a blog on the newly nomenclatured dispersity value. For monodisperse latex standards values as low as pdI = 0.03 can be seen in data. Q: Do small air bubbles in the sample matter in the DLS measurement? A: Yes, they can matter. If it is just a very occasional spike, this is no concern and will in the end be averaged out. Consistent spikes can lead to a peak at large size up to a few microns and beyond, and this will also then be flagged as a comment in the data size quality report. Best way to avoid this can be a quick spin in a tabletop centrifuge. Q: How do you determine the size when the average size on the report differs from the peak distribution on the spectra? A: This was discussed in a previous post on the z-average of peak size. It also mentions the case where the average can be lower/between/larger than the peaks. Q: Speaking of counts per sec what is an ideal count to observe? A: The avalanche photo diode APD inside the Zetasizer is a very sensitive light detector. If it gets too much light, it could be damaged. It also will become non-linear at very high count rates. Recommended count rates for DLS measurements are 100 – 500 kilo counts per second kpcs. In automatic mode, the software will automatically adjust the laser intensity to reach an appropriate scattering intensity from the sample. Q: Is it recommended to use bigger sizes than 100 nm in the Malvern Zetasizer Nano, do they work? A: Yes! Particles bigger than 100nm can easily be measured with the Zetasizer. In fact up to a few microns is the standard range for DLS. We have been able to measure particles up to 10 microns, although sedimentation can become a concern for these very large objects. DLS shines in the nanometer to micron range. A range of various Latex standards measured with DLS are shown in this technical note. Just for clarification and the avoidance of doubt: DLS works well below and above 100nm so it is not required to have particles larger than 100nm. Q: Will small air bubbles in the solution or the dust inside the cuvettes influence the DLS size measurements? If yes, what results will we get? Thanks! A: If the small air bubbles are just stuck to the wall of the cuvette, then this should not be a concern unless they are directly in the path of the laser beam or blocking the detection optics. This can easily be overcome by tapping the cuvette on the table and inserting it again (or as a more advance measure using degassed solvents). If the airbubbles and/or dust are dislodged and floating in the sample, then yes, this could lead to large size peaks in the size distribution and in extreme cases even make it impossible to measure your nanoparticles. Light scattering is very sensitive to the presence of even small amounts of large scatterers in the sample. Yes, cleanliness is definitely a good goal for DLS (even if back scattering is more forgiving than traditional 90 degree optics). Q: How about for size measurement of nano flakes? A: If the flakes are in the submicron range, they should work. The best way to find out is to just try them in an instrument. 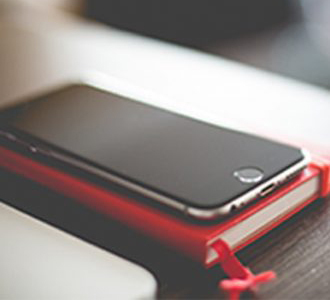 If you don’t have access to one, send us some samples for a complimentary analysis. Q: For some of my analysis the values in the Intensity mode are almost 2 times higher than in the Number mode, why and which values are correct? A: If the results are obtained from good data (that is if the size data quality report has no complaints) and if these are repeatable then this is entirely possible. The reason is most likely a wide distribution, which would by number always be peaked at a smaller mean than its mean by intensity. For more in-depth discussion check out this blog on intensity and number distributions. Q: How do you correlate radius of gyration to hydrodynamic radius? A: The radius of gyration or Rg is a different parameter characterizing a nanoparticle or molecule. Rg comes from the static scattering observed as a function of angle; it is the effective “mean squared mass radius”. In many cases this size is smaller than the hydrodynamic radius Rh. For spherical objects Rg = 0.78 * Rh , see this discussion on Rh vs Rg. Q: What result can you expect to obtain from analysing toluene? A: Toluene is a liquid hydrocarbon [Mw= 92g/mol] that is used as a solvent which is comparatively easy to keep clean. Due to its high molecular weight (compared to water) it is a good scatterer, and this makes it a perfect standard for static light scattering experiments. When placed in the Zetasizer, the scattering intensity measured will provide an excellent measure of the overall sensitivity and health of the system. As a final quality control, the toluene countrate of each Zetasizer is recorded before leaving the factory, so by comparing with this number one can assess if the system is still performing as well as it did when it was manufactured. A typical toluene count rate for a backscattering system should be above 150 kcps, kilo counts per second. A reduced toluene intensity most likely indicates reduced laser power or misalignment. 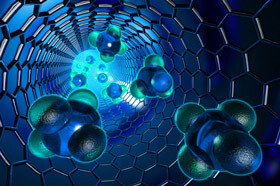 Q: What about characterization of nanotubes? Can these be measured with DLS? A: Yes, they can be measured when dispersed. For non-spherical scattering objects, DLS will give the correct diffusion coefficient. In most cases, users like to see this converted to a size, which would be the size of an equivalent sphere moving with the same diffusion coefficient. This will work for the z-average, and if the dimensions of a rod are known it is possible to calculate the expected hydrodynamic size (via Perrin Shape factor, see for example FAQ Can you get shape information from DLS). Due to the non-sphericity, the pdI or poly dispersity will be higher than the pdI of a sample with only spheres of equivalent size. This is due to the fact that rods move faster along one axis than the other. In extreme cases, the distribution algorithm may even show two peaks: one roughly corresponding to the smaller rod diameter, and the other to an equivalent overall spherical size. Q: What about zeta potential measurements of Nanotubes, is there also an error? A: Yes, zeta potential can be measured from nanoparticles. For Nanotubes this may be a little trickier if they are suspended in a medium of low dielectric constant. The shape itself is no hindrance to electrophoretic light scattering, although it may lead to a slightly broader distribution than from equivalent spherical particles. Q: Is there a way to display the Material on a report page? The default is to display the sample name, but not material. A: Yes, it is possible to display any parameter in a report page; more specifically the material can be added to the report. This is done in the Report Designer (help is in the manual, Tools-Report Designer) by opening a copy of the report you want to edit. Save it under a new name. Then add the parameter which is listed under SOP Material – Material Name. Reports have screen and print views, so this has to be copied onto both version. Check the manual or ask the help desk for assistance. Q: For QC analysis, what is best – Nanotracking or DLS? Because for investigative purposes based on nanoparticles I am more familiar with using NTA or SEM. A: For QC analysis DLS is the more common solution. More specifically the mean size or z-average size and the overall polydispersity index are used for quality control / data consistency type of measurements. DLS accumulates the scattering signal from vastly more particles than NTA, and thus lends itself to provide statistically reliable outcomes in much shorter time. Q: Which refractive index is usually used for fullerene nanoparticles analysis? Q: Hello, How can you treat nanoparticles that aggregate along the measurements? A: If the particles are aggregating during the measurement then the best thing would be to perform manual single measurements, with a shorter duration (try 5seconds) and look at the trend in these. There will be some statistical variation in the result, but it should be possible to deduct the average size and its growth behavior from the observed size changes. If the sample is highly unstable and aggregates too rapidly, try a different preparation, sonincation, pH, additives, surfactanμt, centrifugation, filtration – but in essence the light scattering is telling you: this sample prefers to form aggregates over being dispersed in solution. Q: Where can I find the manual to write up an SOP, for a particular sample? A: This is was one of the tips: the manual is installed on the computer in pdf. 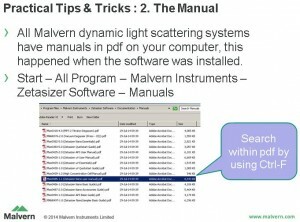 Go to Start – Programs – Malvern Instruments – Zetasizer Software – Manuals and open the Zetasizer Nano User Manual. Search through the pdf with Ctrl-F or go directly to chapter 3 – Making an SOP measurement. A: This depends on the model. For the Zetasizer microV it is 2 μL, for the Zetasizer Nano series 12 μL, and for the automated Zetasizer APS 20 μL. Q: Why would measuring a solvent, like PBS, on its own provide data that is suggestive of the presence of particles? A: The PBS by itself should not contain any particles. What can happen is that there will be random occasional spikes that may appear like a size distribution, but checking the size quality report will clearly indicate the message that these are not reliable DLS data. In other words, the statistics of whatever size was obtained is not really a reliable measure of the size. If there is not such error message and there is a real correlation function, then there just may be particles in the buffer. Check the water by itself, filter the buffer, the count rate from the sample should be ~50 kcps, definitely below 100 kcps. If it is much higher, then the particles are real and are either due to the sample (i.e. in the buffer) or the cuvette. Most likely though, the correlation function shows intermittent jumps and overall a flat line, in which case the “size” observed is really only noise. 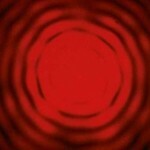 Q: In regards to nanotubes, would you also potentially see a peak due to rotational diffusion? A: Yes, there is a possibility of that happening. However, most likely the smaller size peak is due to the smaller diameter of the tubes though. As an aside, some colloidal gold nanoparticles may show an artificial small size peak due to rotation. Some details are also discussed in the Rotational Diffusion and Results From DLS Measurements document from Malvern. Q: What about Zeta potential measurement of Nanotubes, is there also an error? A: The measurement of zeta potential or electrophoretic mobility is typically size independent, and there should be no error introduced , except for the fact that the zeta deviation parameter may be increased over that of similarly charged monodisperse spheres. Q: Toluene is not a colloid by itself, so why does it scatter light? A: Toluene consists of molecules which have a polarizability. These molecules will scatter light, just a little bit, yet enough to detect. Water also scatters light (but less so, because its molecular weight is smaller.) As an analogy, this is why the sky is blue: scattering from small air molecules in the atmosphere. Q: Intensity size and pdI usually change with the count rate, how do you determine the correct count rate for your particles? A: In our experience it is quite unusual to see size and pdI change with the count rate. The reason for an apparent change could most likely be that the detector is operated beyond its linear range. If the count rate of the detector is for example beyond 1000 kcps then this will influence the correlation function because the APD is not able to keep up with all photons. If operated in automatic mode, this situation should never happen, since the software will aim to keep the count rate between 100-500 kcps. A: The best starting point may be the Quick Start Guide, available on your computer at Start – All Programs – Malvern Instruments – Zetasizer – Manuals – Zetasizer Quickstart Guide. This is a pdf document, which states in part 3 “Making Other Measurements – Introduction” how to see the result just obtained. In short, go to the summary records view (this is the default) and select the Intensity PSD (M) report tab to see the key numbers for your measurement. If this still does not make sense, email the data file to us, and we will walk you through it. It also sounds like the Zetasizer elearning course would be perfect, where these concepts are introduced in detail. Contact the help desk for access. A: DLS can work with any shape material that diffuses. In dynamic light scattering the translational diffusion coefficient is obtained from observing the intensity fluctuations from a sample. If those nanoprisms are in solution and diffusing then the Zetasizer should be able to tell you the diffusion coefficient, and it will also calculate the size of a hypothetical sphere that would move with that same diffusion coefficient. So this should in general work, unless the sample is so aggregated that only large agglomerates (and none of the smaller nanoparticles) are showing up in the scattering signal. There is no harm in putting a cuvette with your sample into the system and see what DLS finds. Give it a try, and if there is trouble with data interpretation, contact us. Q: Is DLS suitable for measuring quantum dots? A: Yes, DLS can be used to determine the size of quantum dots. Please take a look at this application note showing data from both DLS and ELS on quantum dot samples. The only potential complication for DLS could be fluorescence which would show itsleft as a very small intercept in the correlation function (and would also then be flagged in the size quality report). In cases where incoherent, fluorescent light is interfering, an optional narrow band filter may be added to the system to overcome the effect. For a generic DLS overview there is a White paper titled “Application of Dynamic Light Scattering (DLS) to Protein Therapeutic Formulations: Principles, Measurements and Analysis – 4. FAQs” with useful details. Q: How much bigger is hydrodynamic diameter compared to the “dry” diameter? A: This is quite tricky to answer. For solid nanoparticles it may be really close, for particles with polymeric shells, or those with steric stabilization layers, it may be several nanometers. Just for your additional information, please also keep in mind that the “dry diameter” was probably obtained with a technique that yields the number distribution and thus may seem artificially skewed towards smaller sizes when compared directly with intensity DLS data, so take care to compare number distribution with number distribution. Q: Can you comment on 4F+MALLS technique? Is it more accurate? A: When light scattering is combined with a separations technique like field flow fractionation, the resolution of the obtained distribution will be improved over just using light scattering alone. MALLS will provide an overall average molecular weight of the sample in the detection volume. MALLS by itself will only provide an average molecular weight (and Rg) so it is most often combined with a separations technique like FFF or GPC or SEC. DLS on its own will provide both an overall average size and a distribution, however the resolution of that distribution is not perfect. Combining a separations technique with DLS will thus also improve resolution over normal batch DLS. The 4F will give the higher resolution, but to measure the distribution either 4F+MALLS or 4F+DLS are needed – and the two techniques measure different parameters: MALLS is for molecular weight, DLS is for hydrodynamic size. Q: When you do the DLS titration, is it better to track the intensity (kcps) vs pH or Z-Ave vs pH? A: The nice thing is that both parameters are recorded during the run, so can be obtained with one titration and no need to repeat the measurement. Both parameters can be useful and they tell you slightly different things. For example, if the scattering intensity increases this could potentially be due to two different routes: either aggregation or an increase in the presence of existing particles. By taking a look at the z-average one may get closer to the answer of this puzzle: if the size increases –> it’s aggregation. If the size remains constant –> somehow the process is increasing the number of particles (or significantly changing the scattering characteristics of the existing particles). So intensity is the result of both concentration and size of particles, whereas DLS will focus in on the size alone. Q: How critical are nanoparticle concentration limits on the quality of results? A: If nanoparticles are non-interacting then the concentration should not matter at all. 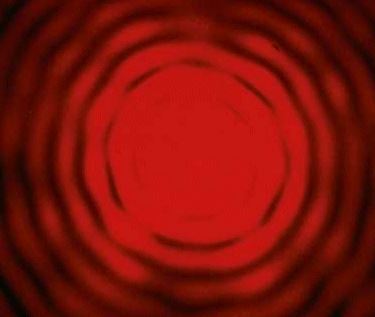 At some high concentration point an effect called multiple scattering may come into play, however this is minimized in backscattering optics. At some low concentration point, there will not be enough signal at all to detect the scattering from the nanoparticles beyond the random noise from the solvent. The theory for interpreting DLS data is built on the assumption of infinite dilution, so if in doubt, perform a dilution series of measurements and check that the size does not change, at minimum there should be an asymptotic behavior for low concentration. 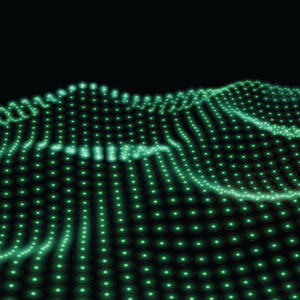 Q: As the EU the definition of nanomaterials is defined as distribution of numbers of particles bellow 100 nm, do you think the mathematical conversion from intensity to number is acceptable to classify the nanomaterial? Or it is necessary to use other methods, like NTA or SEM to have the frequency in numbers? A: The EU policy recommendation indicates that the number distribution is a key parameter and a typical nanomaterial would have more than 50% particles by number below 100nm. DLS natively measures intensity, which can be converted to number. However there may be situations where the intensity from larger particles overshadows the signal from smaller nanoparticles: If DLS (and the number distribution derived from it) shows the presence of nanomaterial according to the definition (i.e. more than 50%) then this should be supportive evidence. However, if DLS (and the number distribution derived from it) does not show the presence of nanomaterial according to the definition then this is not sufficient evidence that there is no nanomaterial present. In order to show the absence of nanomaterial a natively number-based technique such as NTA would be better. There is a recorded webinar reviewing nanomaterial legislation and characterization methods to meet these challenges. Q: How accurate the Volume PSD for colloids of black material such as metal or iron oxide, and how important is it to know what the material RI and absorption is? A: If the refractive index properties are known then the volume distribution should be quite accurate. Repeat the measurement several times to observe how robust the volume distribution from the different measurements is. If the colloids are mostly below 100nm then the refractive index may not have as strong an influence as one might think. The easiest method to check is by editing a data file and trying out a set of refractive index and absorption values to observe the effect this has on the calculated volume distribution. Q: Have you ever determined size of subparticles in plasma? A: If the plasma is somewhat cleaned of large cell debris then it may be possible to obtain information about smaller particles. However, there is a range of different components in plasma that make it quite difficult to identify specific contributions. A number based technique such as NTA allows fluorescent labelling of specific subsections, and this might be more targeted approach. It would be possible to just put a sample into the Zetasizer to try your plasma preparation, in automatic mode the software will its best to measure (but it just may be too broad and not suitable for DLS). Q: What is meant by the particle absorption in the material properties? A: The absorption is the imaginary part of the complex index of refraction. For many materials this parameter is negligible and a few values are listed in this table of nanomaterial refractive index values. Q: Can you explain why a result displaying one peak can have a different peak average than the overall average? A: Yes, this can happen because different fitting algorithms are used in the two fits. Most often, the overall average will be slightly smaller which is due to the fact that the overall z-average fit is defined by an ISO standard to include more of the initial decay of the correlation function. However, other cases can happen as well and you might find looking at the detailed explanation useful. Q: Assuming a monodisperse sample, would you ever expect to see different z-averages when comparing intensity vs number vs mass distribution? A: No. The z-average is obtained from the analysis of the scattering intensity is only defined for intensity. When comparing the z-average in Malvern reports, you should only find the true z-average on the intensity, volume and number distribution reports. These should be the exact same value on the different reports from the same record. Just for clarification, if your question was about peak mean values, as in: “Assuming a monodisperse sample, would you ever expect to see different peak means when comparing intensity vs number vs mass distribution? ” then the answer is yes. The peak mean will be different for the different distributions.